Do you ever get tired of something and in fact, it just pisses you off? Today, a tennis sportscaster has filed a lawsuit against ESPN, the company that brings the world sports on the little screen. And he was hosed by ESPN matter-of-factly. 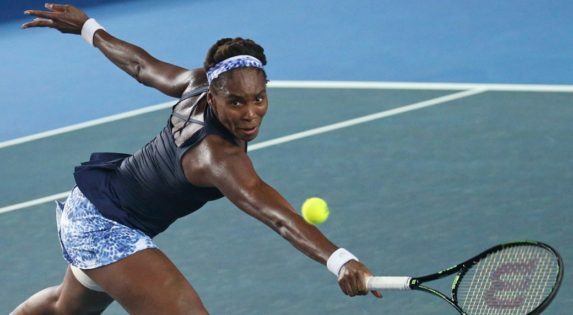 From Christopher Weber, AP: A tennis commentator dropped by ESPN for a remark about Venus Williams during the Australian Open sued the sports network Tuesday for wrongful termination. Adler claims ”emotional distress” in the filing in Los Angeles Superior Court, alleging he was wrongly branded a racist and has lost other TV opportunities because of the controversy. The suit points out that ”Guerrilla Tennis” was the name of a Nike TV ad from the 1990s featuring Andre Agassi and Pete Sampras. ”Obviously, (Adler) saw that commercial many times and the phrase became widely used by those who actually understood tennis vernacular and followed the sport closely,” the lawsuit said. Adler was doing play-by-play commentary on ESPN for Williams’ Jan. 18 match against Stefanie Voegele, saying Williams was playing more aggressively after Voegele missed serves. When Voegele faulted on a serve, Adler described Williams as moving in and charging with a ”gorilla effect” or ”guerrilla effect.” Because the words gorilla and guerrilla are pronounced similarly, it’s impossible to say for certain which word Adler spoke. Offended viewers called for Adler to be fired for comparing Williams, who is African-American, with a gorilla. ”During an Australian Open stream on ESPN3, Doug Adler should have been more careful in his word selection. He apologized and we have removed him from his remaining assignments,” the statement read. I for one have had enough of ESPN and what they think they stand for. I hope that this sportscaster and his lawyers take this company to the cleaners. That is my opinion sports fans. (maybe I need to add that I am sick and tired of everyone being offended every day on every given thing) I did add it.